Think back to when you started your business. 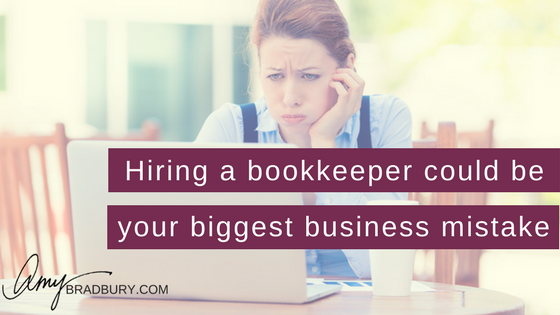 You were probably told that the first person you should hire is a bookkeeper, right? Before you do anything else. Because dealing with your finances is so scary. Bookkeeping is hard. Taxes are overwhelming. Payroll is serious stuff. It’s no wonder that entrepreneurs “grow up” in their businesses believing that money and numbers and financials are something to be avoided. Scary things like monsters that lurk in the night. Except, when you are afraid of them & avoid them, that’s exactly what they turn into – but the monsters in real life often come in the form of letters from the IRS, overdraft notices from your bank and unfortunately -having to close your business. We all know the high rate of business failure in this country. And I would bet that most of those businesses actually did have bookkeepers. Probably really good ones, too! So, what gives? If you did the right thing by hiring a bookkeeper, how could your business still fail? And what can you do to not become one of those statistics? Just because you outsource the tasks doesn’t mean you are outsourcing the responsibility. 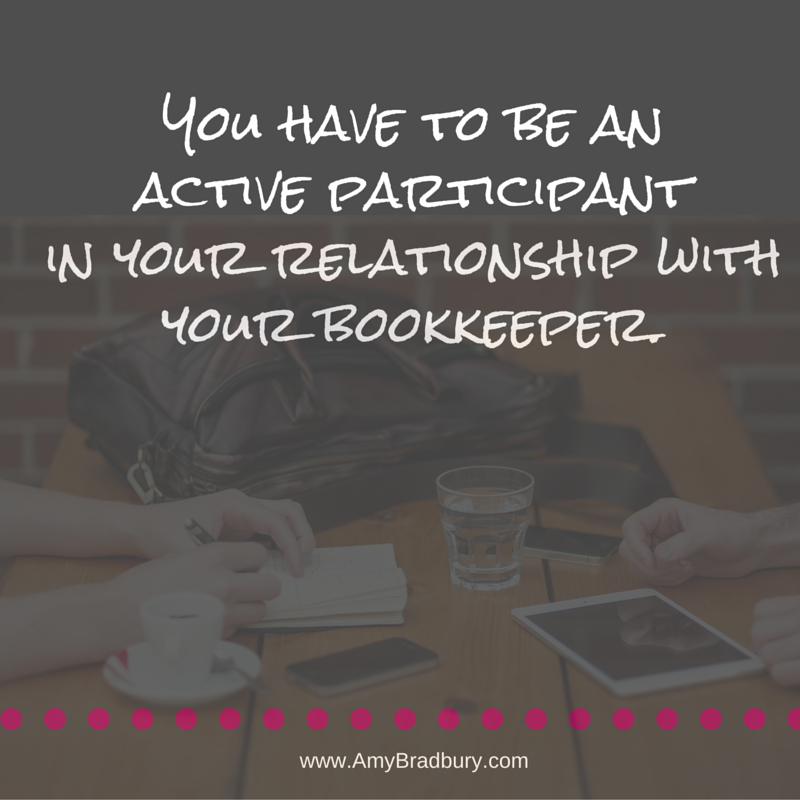 Your bookkeeper is a strategic partner in your business. They want you to succeed. And they probably have a lot of ideas of how you could make your business more successful and more profitable. Don’t treat them simply as part of the admin team whose role is to just categorize transactions & get your ready to file your taxes. Reframing your bookkeeper relationship can be one of the most powerful things you can do for your business. Get clear on why you feel you need a bookkeeper. What are you hoping to get out of that relationship? What do you need more help with? What do you not understand? What are you scared of? Sit for a few minutes and actually write these things down. What would your dream relationship with your bookkeeper look like? Ask them for the help that you feel you need. Do you need to talk with them instead of exchanging emails? Are the reports they are giving you telling you what you need to know about your business? Ask them how you can make their life easier. Perhaps there’s information that you need that you aren’t providing, or that they could access directly without having to ask you. Tell them that you want to participate in the relationship. You want them to explain things to you, send you reports, ask you questions and have an interactive relationship. Oh – and then send them some booze or chocolate 🙂 That always works for me! Here’s the thing. Bookkeepers want to help you with your business. They would love nothing more than to have your business become wildly successful. Don’t hire them and then disappear, avoiding their emails, taking forever to respond to their questions. You are on the same team – and you are the CEO. Tell them what you need from the relationship and watch the transformation unfold! Book a call with me and let’s talk about how you can add a bookkeeper to your team that can help you finally feel empowered about your numbers! Hi Beth, great to hear from you! Your website is beautiful 🙂 Are you in Bari’s program that she offers? It’s really a wonderful resource. What do you feel like you are struggling most with? Would be happy to see if we can help or if we have someone in our network who can. Feel free to email me at amy at empoweredprofit dot com Cheers! Building a Business is an Adventure! Join Me for Tips along the Journey.